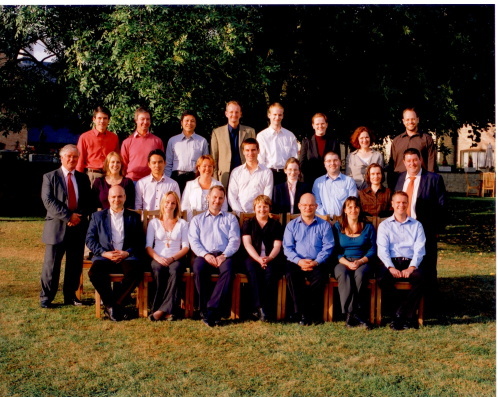 Back row, standing, from left to right: John Tagler (Elsevier US) observer, Paul Carton (Elsevier), Genyiou Umitsuki (Elsevier Japan), Joerg Engelbrecht (Elsevier/Fischer),Christoph von Freideburg (Wiley-Blackwell US), Caroline Wain (Royal Society of Chemistry), Marjorie Spencer (Wiley-Blackwell US), Jamie Hutchins (Cambridge University Press). Middle row, standing, fromt left to right: Richard Balkwill (Course Director), Kathryn Sharples (Wiley-Blackwell), Shuji Uraguchi (Elsevier Japan), Nathalie Jacobs (Springer), Richard Hughes (Wiley-Blackwell), Sharon Kershaw (Wiley-Blackwell), Richard Delahunty (Routledge/Taylor & Francis), Joanna Szymanska (Polish Scientific Publishers), Dave Riddick (Royal Society of Chemistry). Front row, seated, from left to right: Dante Cid (Elsevier, Brazil), Rachel Sangster (Taylor & Francis), Jim Milne (Elsevier -member of organising committee), Pauline Starley (Portland Press), Andrew Stammer (CSIRO-Commonwealth Scientific Publishing-Australia), Silvan Marciano (Wiley-Blackwell), Gary Bryan (British Medical Journal Publishing Group).